The roots of percussion instruments stretch back to the dawn of the human species. Prehistoric man discovered the magic of rhythm and began to make and use primitive drums and rattles (for rituals, communication and for common musical pleasure). Percussion instruments are absolutely ideal for children, as rhythm is the first component of music that children learn. Moreover, children have a close relationship with drums and rattles from an early age. For beginners, we recommend the highly popular percussion instrument known as the Cajon (pronounced 'ka-HON'). This percussion box imitates the sound of a bass drum (when struck in the middle of the soundboard) and even a small drum (when struck at the edge of the soundboard). This instrument can be used in the vast majority of musical styles and can be learned even by a beginner relatively quickly. 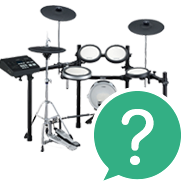 If you would like to consult with our experts on the selection of percussion instruments, we'll be happy to help you. You can call us at 020 8089 1481 (Mon-Fri, 9 a.m. - 5 p.m.) or send us your questions by email to . Djembe drums, probably the best-known and most widely used type of percussive drum, come from West-Central Africa. Their shape is reminiscent of a chalice and usually they are carved from a single piece of wood (there are also djembes from composite materials on the market). Although conga drums have their roots in African culture, most of their development occurred in Latin America, where they were influenced by the synthesis of African and Spanish culture. Conga drums are typically played in pairs, i.e. two connected conga drums on a single stand. The drums are relatively high and have a classic barrel shape that is reminiscent of a 'cropped cigar'. The Cajon is a Latin American percussion instrument that has recently gained great popularity. Cajon is Spanish for 'box' or 'crate', and in reality the instrument truly is a box with a sound hole in the back and tuneable strings strung inside. The instrument is played by beating the box with the hand. 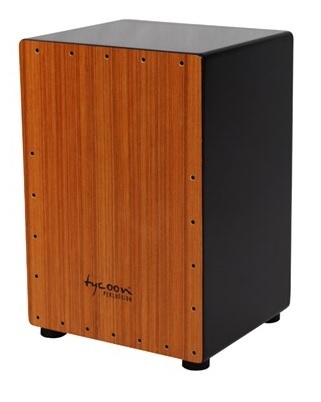 The sound of the Cajon differs not only by the tuning of the strings; different sounds are produced by striking the box in different places and at different strengths. This is precisely why the the Cajon can imitate a wide range of drum types. 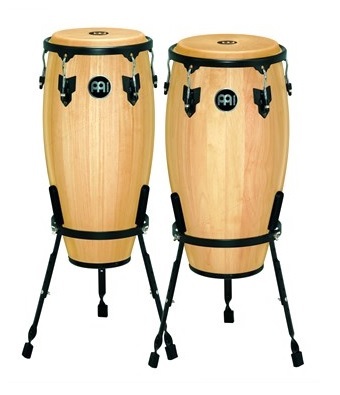 Bongo drums> also come from the Latin American environment (specifically from Cuba). They are composed of a pair of smaller drums. 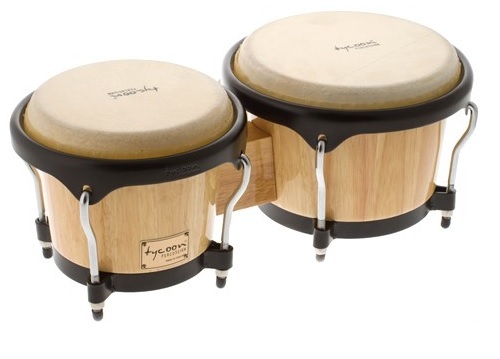 The fact that bongo drums are played with just the fingertips make it an ideal instrument for children. 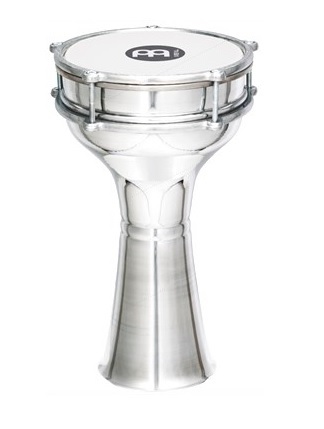 The darbuka is a popular drum of Arab origin. Darbukas are metal drums with a sharp bell-like sound. 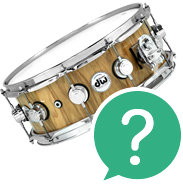 The drumhead is typically synthetic, only rarely from animal skin. 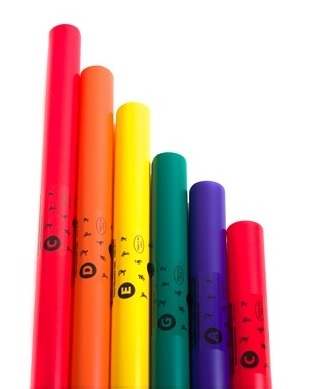 Boomwhackers tubes are an ideal musical instrument for children and groups of children. They teach players to simultaneously feel rhythm and melody. Tone height is represented by individual tube colours, which greatly simplifies playing. Boomwhackers not only teach a feel for music – they also develop a sense of cooperation in a group, which is another reason this instrument should be part of every music classroom. The group of percussion instruments is large and diverse and is mainly composed of a wide range of drums. There are also many types of rattles wood blocks, bells, jingle bells and clappers such are tambourines, claves, maracas, castanets, triangles, cowbells. No less attractive are melodic percussion instruments – vibraphones, marimbas, xylophones, chimes, kalimbasand highly popularhang drums. Djembe, bongo and conga drums are among the most popular. You can often encounter the Arabic darbuka drum, and the popularity of the percussion instrument cajon has also exploded in recent times. A talented cajon player is able to replace a classic drum kit. All of the drums mentioned above are popular because of their universality – they can be played in virtually any style of music. All of these instruments are also suitable for beginners. 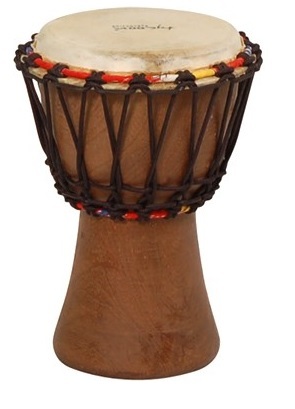 For beginning drummers, we can also recommend African drums djembe. Many percussion teachers recommend them as a child's first instrument. In connection with these smallest drums, you can focus on the special offer of drums for children. Discover mini-drums, wood blocks, rattles, tambourines, Boomwhackers and many other types of percussion instruments ideal for children. 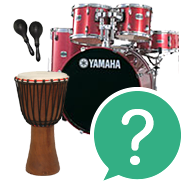 You can even choose from our percussion sets for children. MATERIALS: Percussion instruments are made mostly from wood, while metal, composites and synthetic materials are also used. Cow, calf and buffalo skins are typically stretched over the drums, and these materials are often replaced with synthetic materials today. The heads of djembe drums are mostly frequently goat skin. Drums are typically tuned using string or special metal mechanical systems that either tighten or loosen the drumhead.